The next Windows 10 version may group files automatically in open dialogs. When you use the open option to load files in Windows 10 version 1809 or earlier currently, e.g. to open an image in an image editor or an archive, you get a single list of files sorted by recency. Microsoft's next version of Windows 10, Windows 10 version 1903, and newer versions may change the default behavior. 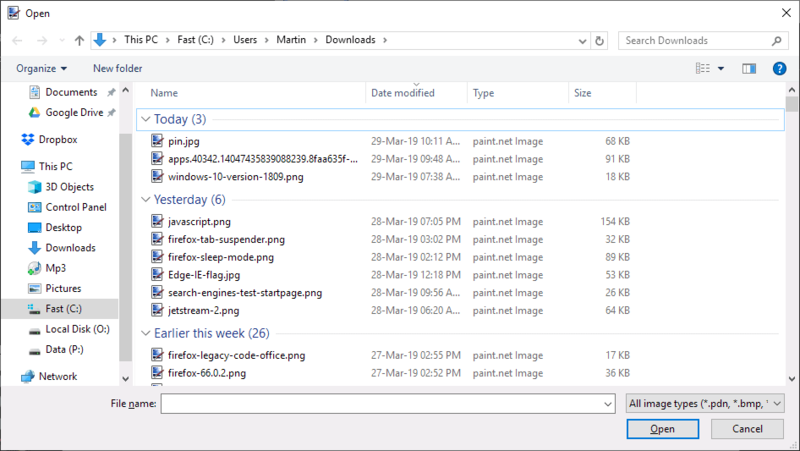 Instead of listing files in a single list, it may group files by date-based criteria. The screenshot below shows an open dialog with the three groups "today", "yesterday", and "earlier this week". Groups are not a new feature in Explorer. I talked about them back in 2008 in Windows Explorer Tip: Show In Groups already, and they have been a part of Explorer for some time before that. While that may be useful at times, especially if you know when a file was modified the last time, it is problematic if you don't have that information but just the file name. Since files in each group are sorted individually, you'd have to go through each group to locate the file or files. An alternative to that would be to use the search option to find the file that way, but that might delay the operation further depending on the number of files in the folder. You may notice that there is no View menu available to disable the grouping of files. There is still an option to do so, but it is hidden from sight. All you need to do is right-click on a blank space in the file listing, e.g. 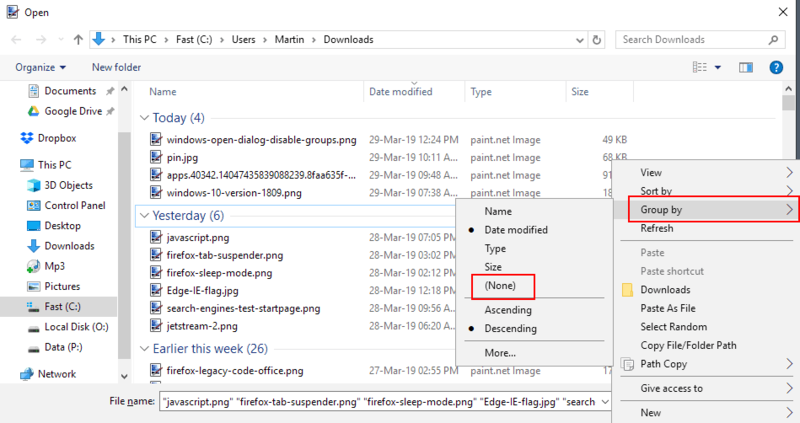 on the right to select Group By > (None) from the context menu to disable the automatic grouping of files in open dialogs. Windows disables grouping immediately after you select none. You may browse a single file listing again just like before after doing so. The context menu displays other options that you may find useful, e.g. to change the sort order or view options. Those are accessible directly in the open dialog window, however. It is unclear if Microsoft is testing the change currently on select systems or if it will be the new default for all users when Windows 10 version 1809 is released. Now You: Do you prefer file groups or a single file listing? Find out how to disable file groups in Open dialogs in Windows to restore the single file listing in those dialogs. As long as there is an option that Explorer doesn’t remove, reset or forget. Otherwise it will be terrible. I’m running 1809. I don’t see file groups in File Explorer, but I do see file groups if I right-click a file and choose Properties > Previous Versions. The dialog box shows “Today”, “Last Week” etc. Is there a way to kill file groups in Previous Versions? Groups are good for folder Downloads.